I give the edge to Martha in the above pictures, though I took that picture before making some of my favorites from the whole process. 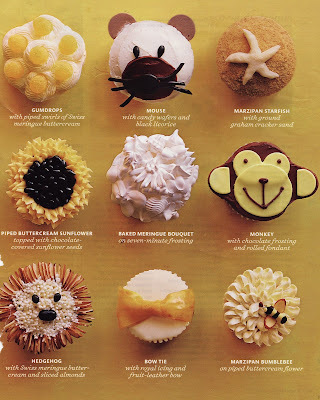 My pal and fellow cupcake adventurer, Alison, created many of these including both that adorable brown bear and the one previously labeled as Fozzy. 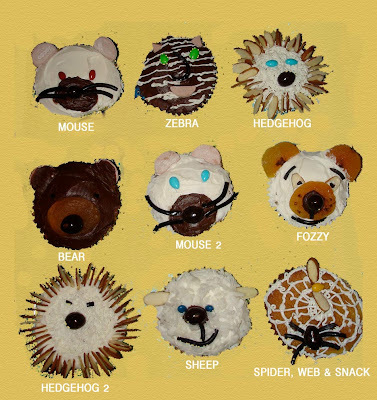 My hedgehog goes head to head with Martha's. Is that a real puppy or just a cupcake version of one? ok, this one is just pretty. And finally: Alison's coup de grâce...I mean, who could top this? Any takers? Martha? Well done! Is that a real puppy? How many of those did your husband make??? I can't tell if i should eat that puppy or train it to roll over.